Vigil-Agrimis Inc. specializes in planning, analysis, and design of water and natural resources projects. Since forming in 1999, the firm has become a leader in providing design services in the Western United States (particularly in Oregon, Washington, and Alaska). By using multidisciplinary teams of engineers, landscape architects, and environmental scientists, the firm has worked on various projects on hundreds of waterways and wetlands. What is the core philosophy of the firm? What sets the firm apart from its competitors? 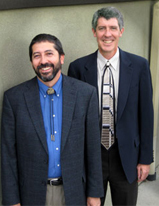 President Ken M. Vigil, P.E., and Paul Agrimis, won the 2007 Small Business Administration Minority Business Award. Some of Vigil-Agrimis' recent projects include restoring a half-mile section of Johnson Creek at Tideman Johnson Park; completing a new culvert and stream restoration project on Wolfe Creek near Tillamook; and designing habitat improvements at the confluence of Stephens Creek with the Willamette River. In a Q&A with Colors of Influence, President Ken M. Vigil shares the Vigil-Agrimis creation story and the unique corporate culture that helps keep the company goiing stronger than ever. What does receiving the 2007 Minority Business of the Year award from the Small Business Administration mean to you? We were really happy to be selected by the SBA. We received a similar award back in 2003, when we were just getting started then. The first award recognized that we had a good idea, and that we’re on the right path. At the time, we’ve only in business for three years, and there’s no telling if we have everything figured out. In a lot of ways, receiving this latest award is more rewarding because it showed that we’re still on the right path. That we’re starting to realize the promise that we showed five years ago. It also gives recognition that we have the respect of others in the small business community, and confirms that our operations are sound and working well. What is the Vigil-Agrimis creation story? Paul and I were both successful consultants for other larger firms. I left the firm to start my own business, as a sole proprietor. I was beginning to have some successes, establishing clients, and I thought it would be nice to have a partner. Paul and I have worked very well together previously, so we began talking about creating a combined firm. After comparing notes about what we wanted in business, we found out that our lists were very similar. We determined our compatibility as business partners, and we decided to form a team as environmental and natural resources consultants. We both come from immigrant backgrounds. I’m Hispanic-American, growing up in Hispanic culture and heritage. Paul is Greek-American. We both grew up in working-class blue-collar families. Both our parents encouraged education, and stressed that getting a good education provided many opportunities. Paul and I took that to heart, so we went to school and did well in college, then earned master’s degrees. Our professional skills also complement each other. 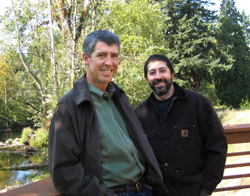 I focus on the engineering aspects of our business, and Paul focuses on landscape architecture. The fact that our skills don’t necessarily overlap has definitely helped our practice. How did your corporate experience prepare you to run your own business? Our corporate experience has prepared us well to run a professional services company. Before we started the firm, we already had knowledge about acquiring clients and managing projects. My wife, whom I met at the firm where we were all employed, works as our accountant. She was the accounting manager at our previous firm. When we started our business, we already had great accounting resources and experience. It helped that we already knew how to run the business, both from the financial and accounting side and the technical and project management side. It wasn’t too big of a learning curve. What were some of the challenges during the startup phase? The biggest challenge we had was communication and information sharing. We started working out of our homes -- the idea was to have a virtual office. I had my home office, and Paul had his home-based office set up in his home. We began adding employees as we got more work, and we set them up in their own homes. At one point, there were six of us working in the company, working out of our homes. Communication became difficult, because we couldn’t easily talk to everybody, face-to-face. Transferring files was a bit tricky because we had to send them over the Internet. We’d have a staff meeting every week at Shari’s Restaurant, where we’d all go out to breakfast together. The first project we had with the Port of Portland was an early break. That came about when I was still only a sole proprietor, before we incorporated. The port had some environmental needs that matched our skill sets perfectly. I had previously worked at the Oregon Department of Environmental Quality. A former colleague there had heard that I had gone out on my own to do consulting work. He needed a water quality engineer, so he called me. The project was a good fit. By coincidence, he also needed a wetlands specialist, a perfect fit for Paul. They hired us, and kept us quite busy for a while. For the first year or two, we did a lot of work for the Port of Portland, and since then, we have diversified considerably. We had about five clients during our first year, and now we have 200 or more. What is the core philosophy of Vigil-Agrimis? Our philosophy is to provide high-quality services, always. That’s the most important thing, and everything else feeds off that. If you do good work, then people would want to hire you again. And they tell other people that you do good work. The environmental consulting business can be a small world. Doing good work – your reputation and performance – opens doors. What is Vigil-Agrimis the “best in the world” at? We’re very best at natural resources design – such as stream restoration, or wetland restoration – design that involves the natural environment. There are a lot of engineers that focus on the “build” environment – streets and roads. Our focus is on the intersection where the natural environment meets the build environment. If you’re building a bridge, we are the people you call on to study the environment near the bridge to make sure the impact of the construction is minimized. If there’s construction activity, we would make sure to restore the natural environment where it needs to be. In some ways, the fact that we’re one of the very few minority-owned businesses in this field offers opportunities. But it also presents challenges. There aren’t that many people of color who focus on environmental engineering. The challenge there is that we try to recruit people of color to come onboard. One of the things we have done is establish an annual scholarship program, teaming up with the Hispanic Metropolitan Chamber of Commerce. They award scholarships to promising Latino and Latina students. It’s good to know that students are studying environmental engineering now. When they finish school, they will have the right background to continue to do the work we do. Why is it important for brown and black communities to be “green”? Regardless of your ethnicity or race, it’s important for all human beings to care about the environment we live in. We’re the stewards of the planet; it’s ours to take care of. Often, it is forgotten that historically, people of color have done great things in terms of understanding the environment, and in science and math. The Hispanic culture has cultivated some of the greatest minds in mathematics, going back to the Mayan civilization. We also have had a close relationship with the land as well, with farming and agriculture. This is true across many cultures of color. We’ve become more urbanized now, but there is no reason that we shouldn’t try to make an effort toward preserving the environment. What do you consider as the key ingredients to the success of the firm? The creativity and ingenuity of our people are key to what we do. We’re a professional services firm. Our clients hire us to help solve problems. We have a personable, down-to-earth and relaxed culture. Most of all, we have a lot of integrity. We speak for what we believe in. We compete against other engineering, landscape architecture and environmental science firms. One of the things that set us apart is that we’re multidisciplinary. We have all three of those ingredients under one roof. We don’t break into departments: we have a landscape architect sitting right next to an engineer, sitting right next to an environmental scientist. As a result of the cross-training and cross-pollination, our engineers are “greener” than most engineers, and our landscape architects have more technical knowledge than most landscape architects. What do leaders need to build a thriving business? Patience: good things don’t happen overnight. Creativity: the ability to see an opportunity, and envision where that may take you. You need to be persistent. In professional services, where people are your main product, you need to have the best quality people. You need to build a work environment where people enjoy working. You need an atmosphere of trust and respect to be able to retain good people. We listen to our people. Our doors are always open. We conduct performance reviews every six months: those are the formal times we set aside to talk to our employees. It’s important because it allows us to learn about things that are working well, and what’s not working so well. It gives us a chance to modify situations as needed. We encourage our employees to continue their professional development, and everyone has a training budget. This includes certifications for engineers and landscape architects. No job is too big or too small. We try to operate like a family, and we lend a hand when something needs to be done. Our culture as a company is an important part of attracting and retaining the best people. If you ask anyone working here what they’re doing for the weekend, they’re skiing, canoeing, or hiking. They spend time outdoors. That’s what draws a lot of people to the environmental field, they like being outside, enjoying the environment. When you spend time enjoying the environment, you end up respecting it. You try to look for ways that you can use your professional skills to help protect and restore the environment. What’s your long-term vision for the firm? We want to maintain a sustainable business. We want to be the right size for our marketplace, while also growing our expertise and reputation. How does your cultural background influence the way you do business? I’m Mexican-American. My mother is from northern New Mexico, and my father is from southern Colorado. That part of the country used to be part of Mexico, and my ancestors living in that part of the country became American after the U.S.- Mexican war. Neither of my parents graduated from college. My father was an aircraft mechanic and my mother was a homemaker. I have always enjoyed doing outdoor activities, so I looked for a field that would allow me to work outside. In college, I found out that I was very good at math. And I also wanted the opportunity to use my analytical skills. My cultural background affects my leadership style. Leadership in my extended family was more about setting an example than preaching to people about what they should do. What it amounts to is leadership by example: I work hard, I come to work on time, ad I treat people with respect. The Hispanic culture is big on families, and I think that is why we run our company like a large family. In terms of being a business owner, what’s most satisfying is knowing that I have helped build a thriving business that creates employment opportunities for like-minded people. We have employees who have joined the business when they were single, and now have families. Not only are we providing income and opportunities for employees, but we’re also supporting their families. Sometimes people think that it’s either by good luck that people start and become successful in business. You need a certain measure of good luck, but it’s really all about hard work. Believe in yourself, and you can do a lot professionally. Regardless of your ethnicity, look at what you strengths are and capitalize on your strengths. What do you consider as your best accomplishment? I’m most satisfied with our stream restoration work in Portland. We’ve done fun projects to make the City of Portland better. 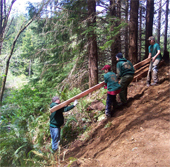 We’ve done work on Johnson Creek, Tryon Creek, and a current project in Stephens Creek. It’s good to know that we’re helping improve the community. "Paul and I both come from immigrant backgrounds. I’m Hispanic-American, growing up in Hispanic culture and heritage. Paul is Greek-American. We both grew up in working-class blue-collar families. Both our parents encouraged education, and stressed that getting a good education provided many opportunities." "We’re very best at natural resources design – such as stream restoration, or wetland restoration – design that involves the natural environment." "The creativity and ingenuity of our people are key to what we do. We’re a professional services firm. Our clients hire us to help solve problems."